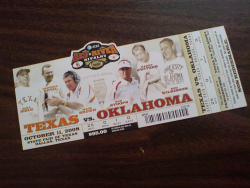 Halftime Card Display - At halftime, fans in attendance took out colored sheets of paper that were placed at their seats prior to the game that spelled out "Boomer Sooner", displayed the University of Texas longhorn logo, and the Carl's Jr. logo. Light Signage - Each of the major light fixtures at the Cotton Bowl were adorned with corporate signage. The signage received tremendous coverage on ABC. Unique Rock Band Mobile Display - A Rock Band mobile display was featured outside the Cotton Bowl for fans to enjoy. The mobile, which tours State Fairs across the country, provided fans with a unique entertainment piece prior to the game. Branded Trash Cans on the Sideline - Trash cans situated on the sidelines prominently displayed Texas State Fair branding. This idea can be benchmarked by teams looking to leverage waste management partners. New Fashion Trends? Female Oklahoma fans wore dresses featuring the words "Boomer" and "Sooner" - outfits made for fans to go to the game in pairs... Are there similar clothing schemes that can be made for your institution/property?